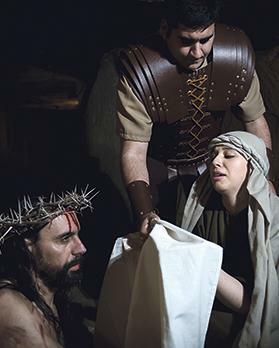 4Teenth Productions, in collaboration with the St George’s External Festivities Committee and Qormi local council, is producing an adaptation of the Passion of Christ in a World War II shelter, located just metres away from St George’s parish church. Yeshua Minaż’rat, more commonly known as Jesus of Nazareth, is a theatre walkthrough production being performed in an underground air-raid shelter, giving the audience a unique and personal experience of Christ’s journey to the cross. The intimate setting this historical place offers makes it ideal to put the audience at the heart of the story, as it unfolds at arm’s length from the onlookers. The audience is encouraged to participate and take on a central role during the performance. It revolves around a convincing scheme between the High Priests who turned Pontius Pilate into their puppet, forcing him to condemn Christ to death at the cross. The audience will be taken on this journey through a series of interestingly written, fast-paced scenes that will continue developing through audience participation, in the 30 minutes the onlookers spend in the shelter. The audience will be put in the spotlight during this production, which will naturally have an impact on the way the story unfolds. For this reason, the actors are being prepared for any circumstance they might come across during the performances. Mario Aquilina, who will be taking on the role of Jesus Christ, will be accompanied by Charlie Sammut, Ruben Rapa, Lydia Portelli, Sandro Attard, Alan Attard and Franky Borg, together with other highly experienced actors. Apart from Yeshua Minaż’rat, several exhibitions will be open to the public in the vicinity, among them Hakeldama, featuring statues made in Lecce. There will also be several exhibitions of statues and religious paintings by well-known artists. During Holy Week, the parish’s statues of Good Friday will be on display in St George’s parish church. Yeshua Minaż’rat, written by David George Camilleri, and directed by Gianluca Spiteri and Josue Formosa, will be held tomorrow and on Thursday from 8pm and on Good Friday from 9am to noon. For more information, call 7909 6060 or visit 4Teenth Productions on Facebook.